Flips welcomes you to our Open Gym time which is posted daily on our website. The Parent and Child program includes our Mommy & Me Classes (0-5 years) plus Tumble Tots (18-36mo). Our Preschool Gymnastics program accommodates a spectrum of ages with classes for infants thru kids 6 years of age. Our Gymnastics program includes Level 1 thru Level 4 classes for your child aged 7-12 years. Our Tumbling program consists of a Level 1 thru Level 3 progression for your student aged 7-15 years. Our Boys Gymnastics classes are: Lil'Boys Flip Class 4 - 6 years and Boys Flip & Swing for boys aged 7-12 years. 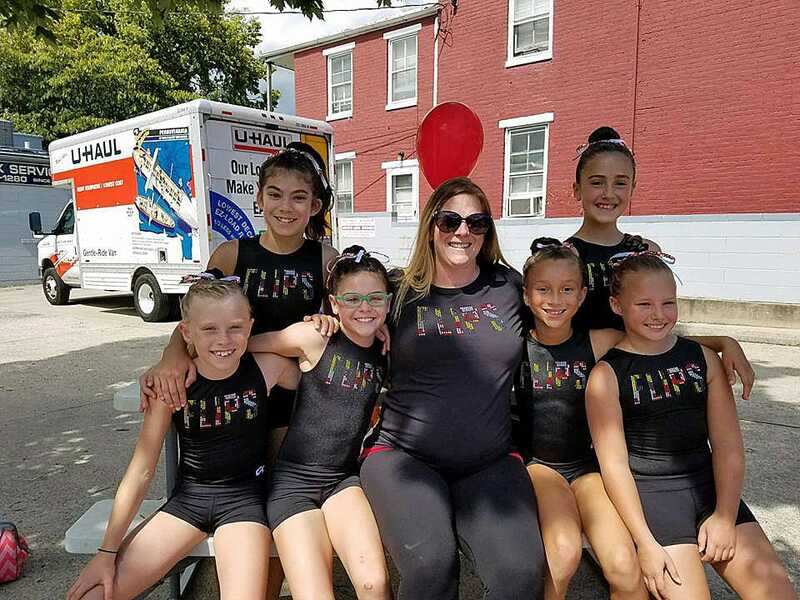 Flips USA Gymnastics Team has gymnasts ranging from 6-17 years old, and competing in Maryland, Virginia, Pennsylvania, and internationally. We offer a half-year program with tumbling and a half-year program without tumbling. Join us for competitive events as well as other special fun events at Flips. Flips invites you to schedule a memorable gymnastics birthday party with us! 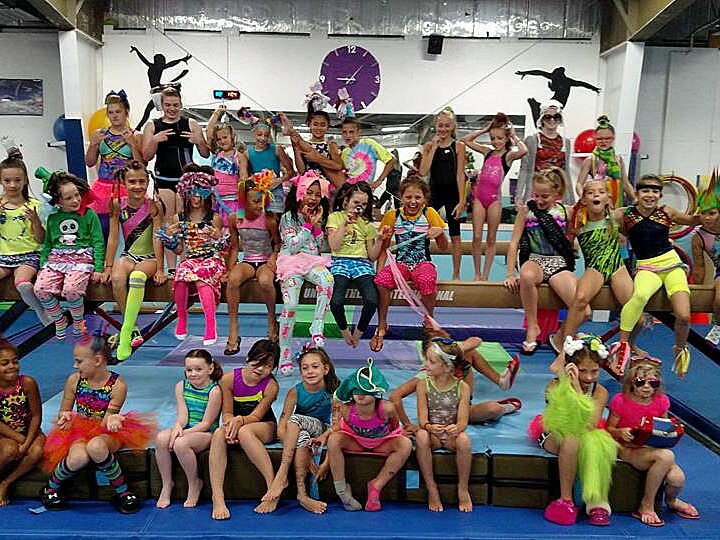 Make your next birthday party a memorable day - a gymnastics birthday party at Flips! Flips offers an flexible summer program including summer camps and weekly summer classes. Flips is operating under normal business hours. Our owner & director, Ms. Angela Boyle, is a lifetime competitive gymnast. Additionally, she was a Division 1 diver and pole vaulter at the University of Tennessee. Ms. Boyle, along with the staff at Flips, model the dedication & energy of an organization totally committed to providing you and your child(ren) our best in the world of gymnastics. Flips offers competitive gymnastics in addition to recreational gymnastics classes. We proudly offer a USA Gymnastics Team. 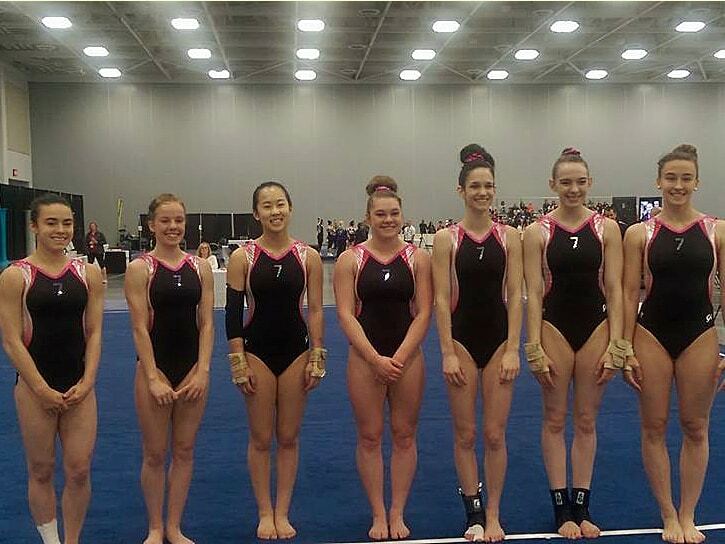 Flips typically hosts two competititve invitationals per year and is a sanctioned USAG facility. We also provide recreational exhibition competitions. Exhibition Competition provides the opportunity for our gymnasts ages 6 and older to perform routines on each in-house apparatus in our gymnastics gym. So this is similar to an Olympic style of competition complete with awards, scores, and more. Flips receives consistently high reviews on Facebook and Google and read Our Testimonials. What people have to say attests to the high degree of commitment we give to you and your child each day at Flips! Flips is very committed to our clients and we strive to offer the best classes, services and team programs. If you have an interest in a class not currently offered by Flips, please feel free to bring it to our attention for consideration. Flips understands the importance of keeping our parents informed of their child’s progress. We provide progress reports for students ages 5+ years. A Level Completion Certificate is provided upon completion of each leveled gymnastics class. If you are a family new to Flips, and if after your child's first four lessons you are not completely satisfied for any reason, we will cheerfully refund 100% of your child's class tuition for that term, NO QUESTIONS ASKED. Flips offers online class registration. Avoid in-person waiting in lines to register. Instead, you can register for gymnastics classes from the comfort of your own home. Check out our Parent Portal. Our month-to-month billing helps to keep tuition at a manageable rate. Additionally, with month-to-month billing, our classes are always open for registration. Therefore, there is no need to wait until the end of a session to register for your next class. 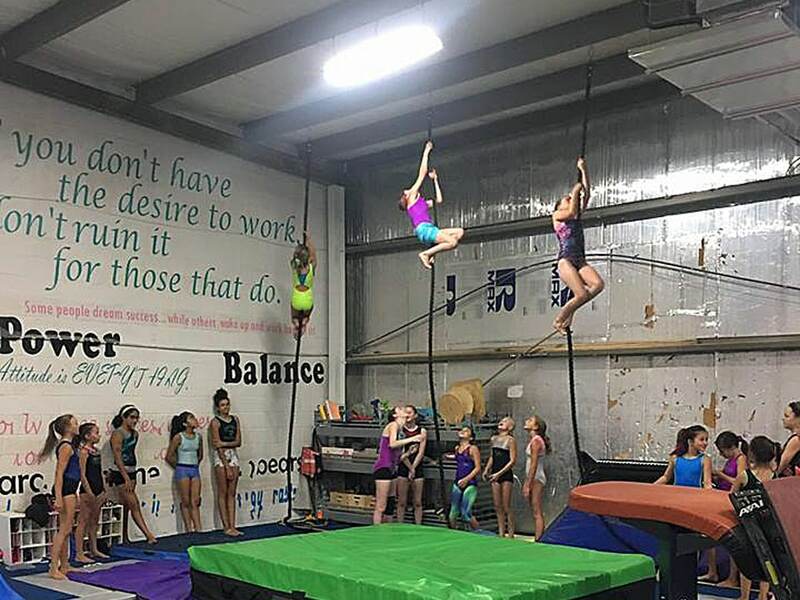 Flips is a gymnastics gym, located in Frederick, MD. We offer gymnastics training for kids as well as for adult gymnasts, aged 1 year thru adult. Our mission is to teach children self-empowerment through gymnastics and sports. We specialize in providing competitive and recreational gymnastics in a fun and challenging atmosphere. Our gymnastics classes are tailored for toddlers, children and teens, with the core of our children’s classes consisting of preschool and elementary aged children. We strive to obtain an atmosphere of fun and learning. Flips strongly believes in a progressive learning style to enable each child the benefit to learn and progress to the best of their ability. The staff at Flips are teachers of gymnastics and sports skills. Moreover, their top priority is providing an environment where children will obtain the skills necessary for a happy, healthy and self-motivating life. Our expansive gymnastics center is state-of-the art, offers a gymnastics gym complete with gymnastics equipment that includes (mats, horses, bars, beams), along with cardio equipment, as well as a homework/business center. In addition to gymnastics classes, we offer dance classes for kids, a cheerleader program called “All Star Cheer”, a USA gymnastics team program, and our Flips special events. Why not book your child’s next birthday party at Flips? Please consult our Programs Page for a complete list of our gymnastics programs. Our passion and commitment to fun family fitness makes Flips an asset to our Frederick, MD community and to the mid-Maryland region at large. Angela Boyle, our founder, ensures the professionalism of Flips with her 20+ years of industry experience. Flips is very committed to you, our clients, and we do our best to offer the classes, services and team programs that best suit you. We understand that mutual communications between client and service provider is essential for success and complete customer satisfaction. Therefore, we consistently provide up-to-date information on this website, and we welcome your feedback as well. Our Open Gym Schedule plus Weather Updates are posted here. Our Policies and Procedures Page details our operating procedures, so we ask that you familiarize yourself with it. We are so confident that you will be delighted by the gymnastics program at Flips gym, that we offer a 100% Tuition-Back Guarantee to new families enrolling in their first term. So, we welcome you to Flips Gymnastics of Frederick, MD! Contact Us TODAY to learn how you can become a member of the Flips Family! Was somewhat disappointed after my daughter’s first few classes but the way that Flips reached out to us afterwards was A+ customer service!! I love this place and love to see my daughter grown and learn! She is in Mrs. Melissa Little Gymnast and she is growing into a great a gymnast! My oldest loves Mr. Andrew and loves her tumble class! Love the open gym and classes. My 3 year old was shy at first during class. Melissa ( teacher) was positive and by the end of class, he was smiling from ear to ear! It’s my daughters first time doing gymnastics and the coaches and staff are all great and very supportive! I love this place! Go to Our Full Portfolio! Flips is happy to help. Please Contact Us online.